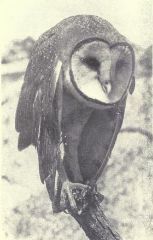 Vintage photograph of a barn owl. This portrait-like photograph of one of the most recognized species of owls is in the public domain and can be freely used in your next creative project using bird images of owls. A big name for a big book full of wonderful bird images. They were drawng by Chester A. Reed (1876-1912) and appeared in the 1914 release of The Bird Book, Illustrating in natural colors more than seven hundred North American birds; also several hundred photographs of their nests and eggs.